Corporate Data Recovery in Melbourne provides data recovery services to both private individuals and businesses owners. Our service processes physically or logically damaged/lost hard drives in order to retrieve formatted data which would otherwise be impossible to read using normal methods. 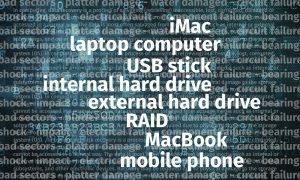 Data is most often salvaged from internal or external hard disk drives (HDDs), RAID, solid-state drives (SSDs), USB sticks, flash drives, RAID systems, laptops, portable devices such as notebooks, pads or mobile phones. Data Recovery is device independent and we are able to offer services to Windows, Linux and Mac operating systems. Corporate Data Recovery can help you recover your lost data from any type of Internal and External Hard Drives. See the hard drive recovery process and cost here. We all know how badly laptop parts are sensitive and vulnerable to damage through accident and even normal wear and tear. Check the laptop drives data recovery cost and process. The RAID storage system was introduced over 15 years ago. An excellent system for bulk data storage. RAID or Server System can fail and make all of your data inaccessible. Find the process and cost of RAID System data recovery here. Corporate Data Recovery can help you to recover lost data from water damaged or logic system damaged devices. Check out the cost of mobile phone data recovery service. We can recover corrupted files from a flash drive or even if your flash/USB drive not recognized. Check the cost of USB Stick Recovery here. Corporate Data Recovery can retrieve your lost data from Apple devices. Our experienced technicians can recover data from dead MacBook Pro hard drive, can restore data from iTunes, iOS devices within very short span of time. Check our Apple iMac Data Recovery options here. Why choose Data Recovery Melbourne for your data recovery? Your data will be secure, safe and confidential with Melbourne Data Recovery. Corporate Data Recovery is trusted by Australian businesses and private customers. Our Melbourne Data Recovery technicians are trained to successfully recover data from damaged or partially destroyed hard drives, solid state (SSD) hard drives and removable media. In addition to physical data recovery expertise, they can recover data stored on file systems by Microsoft Windows, Apple Macs, Linux and Unix operating systems.